Released in 2002 for the PlayStation 2, Konami's Suikoden III was the last Suikoden title worked on by series creator Yoshitaka Murayama. With the first two titles both ranking among my favorite Japanese role-playing games, my anticipation for the third installment was high, my expectations perhaps unrealistically so. Despite some controversial changes, however, Suikoden III actually exceeded those expectations by providing a narrative that managed to be engaging without ever rehashing previous storylines. The first two games on the PS1 became classics primarily on the merits of their stories, which, feeling more like novels than films, were linear tales told in a straightforward fashion typical of JRPGs from the 16-bit era and probably even earlier. Suikoden III, however, matched the quality drama of the earlier stories with a more sophisticated narrative that unfolded via the "Trinity Sight System," which allowed the player to view the story from the alternating perspectives of three different protagonists. Gone were the silent heroes of the first two titles, replaced by three fully fleshed-out protagonists, who all possessed enough charisma that each could have carried a forty-hour JRPG on their own. Hugo, a young boy of the Karaya Clan, was the clearest successor to the wide-eyed heroes of the first two games. Kindhearted by nature, he would find himself grappling with his emotions, struggling to comprehend war, as tragedy forced him to grow up too quickly. The shrewd and enigmatic Geddoe, a veteran who had seen his share (and maybe more), worked as a mercenary for Harmonia, the reigning superpower of the Suikoden world, but his interests seemed to lie elsewhere, and uncovering his stake in the events would be one of the game's compelling mysteries. Finally, my personal favorite, Chris Lightfellow, was the acting captain of the Zexen Knights. Thoughtful and pragmatic, yet fierce in her convictions, Chris's greatest conflict was internal, as she balanced her responsibilities as a leader against her weariness at the Zexen council's obvious attempts to cast her as their nation's beloved "Silver Maiden" in order to rally public support for a cause she herself questioned. She gets my vote as the greatest heroine in video games. 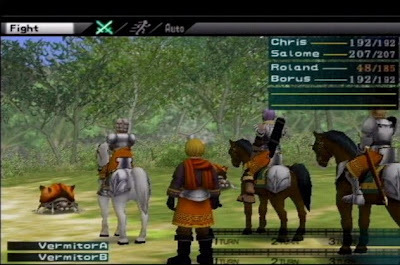 Suikoden III, like its predecessors, was a war story with a huge cast of characters, including the requisite 108 Stars of Destiny, but it otherwise deviated significantly from the Water Margin-inspired formula of the first two titles. Rather than having the player unite the Stars of Destiny to free the world from a tyrannical empire, the narrative let the player see both sides of the conflict between the Six Clans of the Grasslands, represented by Hugo, and the ambitious merchant nation of Zexen, represented by Chris. The Trinity Sight System allowed the player, in some cases, to see the exact same scene from opposite angles, and the player was free to choose the order in which they were presented. 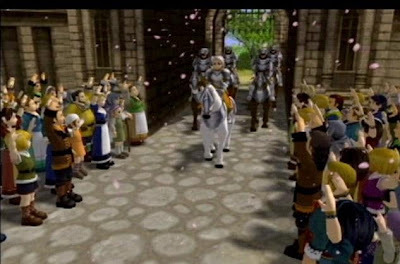 Chris, as a Zexen knight, might appear in Hugo's story as the villainous bringer of much suffering to the Karayan people, but, at the end of that act, the player could then switch over to Chris's version of the same events and see that things were not as black-and-white as they appeared to Hugo's young eyes. The suspiciously well-informed Geddoe, meanwhile, observed events from a third, more neutral perspective. Working in the background, his team's presence would not figure into the other protagonists' scenes, but it would be through his perspective that the player would uncover and investigate the more devious machinations lurking behind the scenes. One of the best side effects of the Trinity Sight System was that it allowed for a more developed secondary cast, since each protagonist also brought along a team of supporting characters. Rather than slapping a different stupid accent on each character and attempting to pass that off as personality, the Suikoden games had always tried to provide most of the 108 Stars of Destiny with distinct backstories, or at least hints at them. Still, with such a massive roster, it was never possible to go in depth with any but the characters most involved with the main plot, so, typically, players would be treated to just enough personality to make them wonder who these people really were. Between Sgt. Joe's wry life lessons to Hugo, the playful rapport of Geddoe's ragtag band, and the devotion of Chris's knights to their captain, Suikoden III was the finest realization of the promise of a huge cast. Since the three protagonists did not share one army as in previous installments, recruiting of the 108 Stars of Destiny was mostly handled by a fourth player character, the humble Thomas, who inherited the previous protagonists' unlikely role as the young castle master. Lighter on story and more open-ended than the others' perspectives, his segments retained much of the old Suikoden joy of meeting strange and varied personalities. With most of the game's true warriors attached to the three main characters, the subplot of Thomas and his colorful assemblage of misfits' clumsy defense of the home they had built for themselves, less a fort than a bustling town that happened to be located at the center of an emerging war, provided a welcome reprieve from the heavier content of the main story. The first two installments stuck to a 2-D style with sprites that, though charming, would not have looked far out of place on a 16-bit console. Suikoden III finally brought the series into 3-D, and, while series fans might have been justifiably anxious about this apparent departure from the franchise's roots, the result was a resounding success. 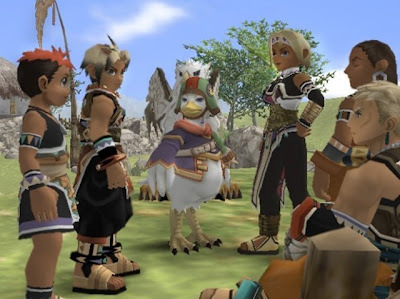 While the character models were far from being the most sophisticated on the PS2, the game definitely took advantage of the higher graphical fidelity of the hardware which finally allowed for characters with actual faces, as opposed to the blurry messes that were the norm on the PS1. Rather than focusing on pyrotechnics and stunt work, the game's new visual style used exaggerated proportions and facial features to better emphasize character personality. The reserved Chris, for example, conveyed a full spectrum of emotions through just her eyebrows. Pre-rendered cut scenes were extremely few and far between, but the real-time sequences exhibited a subtle maturity beyond even many bigger-budget, more eagerly cinematic games of the time. Deliberate use of multiple cameras, closeups, and reverse angle shots added a new dimension to simple exchanges of dialogue. On the downside, the 3-D environments were, by their nature, more cumbersome to navigate. This included the player's castle, which, while still charming, felt a little less inviting than in previous installments, despite also being smaller. This was more due to the fact that, for most of the game, the castle was really not the base for the three main characters and their respective parties. After all, the three represented separate, even opposing interests. Furthermore, there was no longer a traditional overworld, and the game instead progressed through five chapters of fairly restricted movement, so there was less of a sense of a home base to return to. The castle was still home to a few mini-games, though nothing as compelling as the cooking side quest from Suikoden II. The most amusing diversion was the theater, where the player could stage plays, casting members of the army in roles from a selection of short scripts, then leaving a show running to automatically accumulate admissions money while the player moved on with the game. Some characters were more natural performers than others, and a favorable reception from the audience could actually provide a modest income, though it was often more fun to watch the truly disastrous performances. A rather cool bonus allowed veterans to import their Suikoden II save data to unlock an extra play that humorously misrepresented a certain scene from the last game. And if that save data in turn contained imported data from the first Suikoden, the player would be rewarded with another bonus script that reenacted events from that game. The move to 3-D affected combat as well, as the battle system was completely overhauled. The now 3-D battlefield introduced spatial considerations, as, even though the system was still turn-based and menu-based, characters would have to actually move around to get at targets, and friendly fire on spells forced the player to note their areas of effect before casting. The traditional six-man party was broken up into three pairs, and the player could only give a single command to each pair. Many fans were frustrated by the lack of total control, but I found the system fresh and interesting, which combat had never been in the previous games. The strategic battles of the first two games returned in a new form. Units were now moved about a board of connecting vertices, while the actual engagements were handled by the AI using the game's regular battle engine. Also returning, the newly enhanced duel mode was as complex as it would ever become, replacing the old health meters with a sort of tug-of-war bar that shifted momentum as one side scored more hits. Less controversial than the changes to the battle system but more significant, in my opinion, was the report of series creator Yoshitaka Murayama's departure from Konami midway through the game's development. Murayama, who wrote and directed the first two installments, is believed to have written the entire Suikoden III scenario as well, but we'll probably never know for sure how closely the finished product adhered to his vision. Although he is not listed anywhere in the credits, GameSpot interviewed him, naming him as Suikoden III's producer, less than a year before the game's Japanese release, so he was clearly still in charge for most of production. Some fans have tried to pinpoint the moment of his departure from development, usually pointing to the last two chapters, where the narrative did admittedly falter somewhat. Dispensing with the groundbreaking Trinity Sight System, the final chapters shifted focus away from the war, as the ultimate villain was revealed to have had decidedly more godlike motivations than previous series antagonists. After a ponderous lecture on dharma and chaos, the final battle led into an ending that left the land with still a precarious peace. If not quite in quality, the ending was still consistent with the story's logic up to that point, however, so I'm inclined to believe that Konami was following Murayama's script even after his exit. As is typically the case with these matters (and it's a distressingly common story), at least with the Japanese companies, details remain scarce as to why things turned out the way they did, but the general belief is that Murayama had a falling out with Konami over restrictions on his creative control. Before things got that bad, he had at times alluded to a master plan detailing the complete history of the Suikoden universe, and his titles were known for teasing at a larger world that opened up just a bit more with each installment. Perhaps, rather than such an exhaustible scheme, Konami favored a more open-ended future that could allow the series to continue for as long as it remained profitable, hence why all of the post-Murayama titles have been prequels that have gone nowhere. That's all speculation, of course. All we really know is that, as a result, we are left with questions raised in the first three titles that have yet to be answered, and threads that will likely never be resolved, at least not as originally intended. For the fans, it's one of the frustrating realities of the industry that defines gaming as more of a business than an art form. As the followup to my favorite RPG of all time, Suikoden III faced ridiculous expectations, but, astoundingly, it managed to live up to its heritage and did not disappoint at all. Was it a better game than its immediate predecessor? No, but it remains second only to Suikoden II on my list. All right, I'm sold. But would you recommend the Suikoden games to someone who never finished Final Fantasy V or Xenogears? Yet in an age of rapidly advancing JRPG style/substance, I'd rather return to Xenogears than start another Final Fantasy XII. And I was hoping for a bizarro Essentials this time. They're less challenging than Final Fantasy V, the stories less obnoxious than Xenogears. I would hardly call them casual affairs, though the first Suikoden could be beaten in about fifteen hours. As I wrote the 7th Saga entry, I realized that, as much as I dog the game, I actually really like it. On reflection, there have been a lot of merely bad games that I don't remember well enough to post about, but only a very small handful that I actively loathe. My plan now is to spread out the games I hate, so that I run out of them around the same time as the more numerous praiseworthy ones. Then, if I still feel like continuing on, I'll have to drop the "Essentials" name and cover some of the mediocre titles I've played.